So the first month of the year is over already. In some ways it's gone really quick and in other ways it hasn't (for example waiting six weeks to get paid!!). One of the girls at work is obsessed with Christmas and keeps giving me the countdown for Christmas 2014...! Here's what I used up in January. I loooooove this cleanser! My favourite thing about it is the thick, creamy formula, which really feels like it's giving your skin a thorough cleanse. It's great for oily/combination skin as it removes excess oil from the oily areas yet doesn't dehydrate the drier ones. Full review here. Re-purchase? Yes I already have. Plus now the bottle is 200ml for the same price so you get more for your money! I really enjoyed using this scrub - it has a gorgeously fruity scent and a winning formula of sugar granules suspended in a mixture of butters and oils. This means it doesn't feel harsh and leaves your skin feeling more hydrated than before your shower! Full review here. Re-purchase? No - but only because I want to try all of Soap and Glory's scrubs! I have the choice between Pulp Friction or Sugar Crush - which would you recommend? I've raved about this exfoliating toner a few times on the blog now and it was one of my favourite skincare products of 2013. I'm not sure if I'll ever go back to a manual exfoliator. I find the biggest difference to my skin comes with using this every day - not just with dryness but with calming and controlling my spots too. Full review here. This was a lovely lip balm to use, containing Beeswax to keep my lips soft and moisturised. Lychee Shimmer is clear but with a subtle hint of shimmer and smells fruity but quite sweet too. Great for daytime. Full review here. I received this in a Love Me Beauty box last year and use it morning and night just on any areas of breakouts. It's not an instant miracle worker, but I find that when I stop using it my spots do take longer to clear and look redder and angrier. Re-purchase? I have purchased another 10ml bottle because the full size is £44.00, so quite a lot to spend on one product in one go. However I seem to be using up my second bottle quite quickly, so I think I may have to bite the bullet next time! I used this beauty up right at the beginning of the month. The scent of Christmas Spice is cinnamon and cloves, which is just one of the best festive scents in my opinion! Re-purchase? I would love to use this again next Christmas, so yes. Another beautiful candle, which was lovely to use over the festive period. This one has a woody scent (think pine, cedarwood and eucalyptus), which is designed to treat tiredness and encourage focus. Maybe it's partly pyschological, but I really do think this helped!! Now it's empty I'm doing to take a tip from fellow blogger Evelyn and use it as a makeup brush holder! Re-purchase? I loved this scent but I would love to try some of NEOM's other scents first - problem is there are so many to choose from! What products have you used up recently? Do you use any of the ones mentioned above? *Items marked with a star indicate that they were originally given to me as a PR sample. 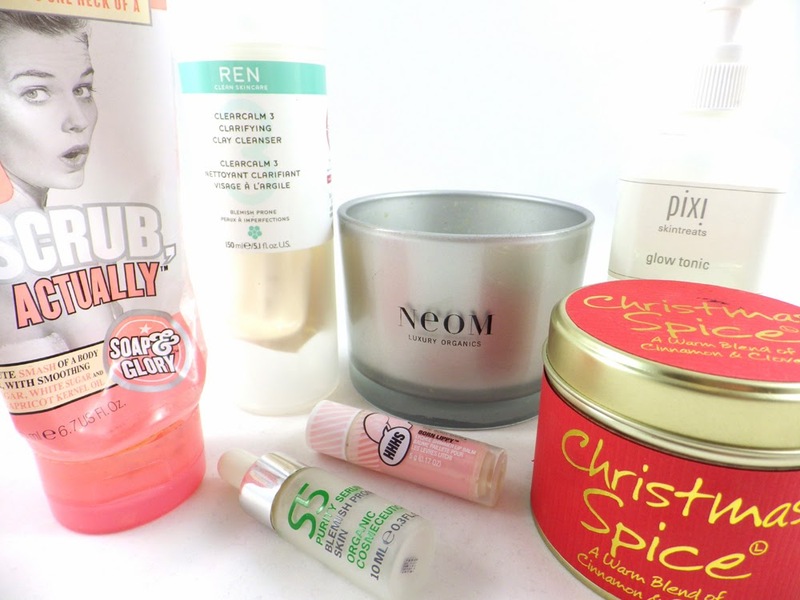 I'm desperate to try the Pixi Glow Tonic - this post has only convinced me that I need it all the more! I really couldn't get on with the REN cleanser but I love everything else in the ClearCalm range - strange. I love those Born Lippy balms!